As Preserver of the Universe, the Hindu god Vishnu appears in one of his many forms whenever he is needed to restore order to the world. In this image, Vishnu is depicted as the cosmic monarch. He is flanked by his consort Lakshmi, goddess of prosperity and beauty, and Sarasvati, goddess of arts and learning. Lakshmi holds a flywhisk while Sarasvati plays a stringed musical instrument. 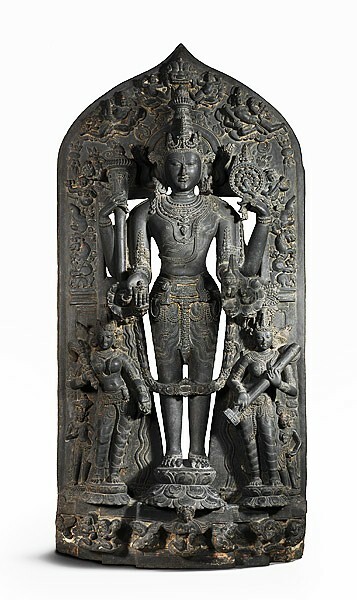 Denoting his divine status, the crowned Vishnu is represented with four arms, standing on a lotus. In his hands he holds a conch shell representing the power of creation; a mace to intimidate those who oppose the truth; and a discus, the symbol of destruction and cosmic order. His fourth hand is extended in a gesture of charity. Vishnu’s powerful eyes encourage an important aspect of Hindu image worship—darshan (seeing)—when the divinity and devotee exchange eye contact. – Can you imagine this Idol’s origin and where it is kept now ??? Canberra is the capital of Australia. The city is located at the northern end of the Australian Capital Territory, 280 km (170 mi) south-west of Sydney, and 660 km (410 mi) north-east of Melbourne. The National Gallery of Australia is the national art museum of Australia as well as the largest art museum in the country, holding more than 166,000 works of art. Established in 1967 by the Australian government as a national public art museum, it holds the nation’s most important and comprehensive collection of Asian art. Sculptures, textiles, paintings, prints and manuscripts, all of exceptional quality, are displayed in three main spaces dedicated to Art of the Indian subcontinent. The Art of the Indian Subcontinent gallery houses a treasury of rare and valuable works of art spanning nearly two thousand years of creativity. Times of India of date and other media report that the Nation has regained possession of an idol from Tamil Nadu, estimated to be at least 1,045 years old, stolen and smuggled out by a cartel led by infamous idol trafficker Subhash Kapoor. National Gallery of Australia (NGA), Canberra, returned the Narasimee idol -an artefact of priceless historicity but one that experts currently value at close to Rs 2 crore in the underground market -to India recently. Kapoor, currently facing trial and lodged in Trichy Central Prison for looting and smuggling ancient relics out of the country , sold the idol he took from Vriddhagirisvarar Temple, a shrine to Lord Shiva, in Vriddhachalam, a town around 200km south of Chennai, to the gallery in 2005 for $275,000 (the equivalent of Rs 1.49 crore at the time). Inspector general of police, idol wing, A G Ponmanickavel described the idol as "a rare piece", even among the many exquisite artefacts in temples across the country. Investigators with the state's CB-CID idol wing said Kapoor, who police believed operated a $100-million international smuggling racket, personally conducted a reconnaissance of the temple before commissioning a gang of thieves to loot the statue from the temple in 2002. The gang used cranes to lift the statue out of the temple, investigators said. "Kapoor's gang sold the artefact along with five other stone idols of Hindu deities from the temple in Vriddhachalam an investigating officer said. "The temple's caretakers did not report the offence to police immediately." The idol wing sleuths, with the assistance of the Australian Federal Police, are trying to trace a Pillayar idol, an Ishtashakthi idol, a Gnanasakthi idol and a Giriyasakthi idol, which Kapoor purloined at the same time as the Narasimee artefact. "The artefacts, weighing a total of 210 kg, travelled a long distance," the officer said. "We believe the Narasimee idol went through at least three continents before ending up in its final destination." The officer said Kapoor hid the idol for some time at his Art of the Past gallery in Manhattan, New York. The idol wing police discovered that the Virudhachalam police had in 2013 registered a case pertaining to the theft of the Narasimee idol. Though the then joint commissioner of Tamil Nadu Hindu religious & charitable endowments (HR&CE) department reported the theft of only one idol, an Arthanareeswarar stone idol worth Rs 1.66 crore, idol wing sleuths found that five others idols were also missing from the temple. "After stealing the ancient artefacts from the temple, the gang replaced them with fakes in connivance, we believe, with former caretakers of the temple," the investigating officer said. "The caretakers, now in Vriddhagirisvarar Temple in Virudhachalam, told investigators that they were unaware of the theft. They believed the idols in the temple were originals till the idol wing police traced the genuine Arthanareeswarar idol." "The gang used cranes to transport the idols to various vehicles from the temple, which is spread over several acres," he said. "Kapoor transported the idols to Chennai and then to Mumbai. He sent it to New York via Hong Kong and London." Kapoor fabricated forged provenances for the Narasimee idol and sold it in what he presented as a bona fide deal to National Gallery of Australia in Canberra. Police earlier arrested suspects in the theft of the idols, Oomai Durai and Anna Durai. They admitted to stealing the idols from the temple and transporting them to Mumbai. Other suspects, Nachu alias Lakshmi Narasimhan, and two antique dealers from Mumbai, Vallabh Prakash and Aditi Prakash, took part in the heist. Narasimhan helped make the fake idols that the gang replaced the originals with. Investigators will produce the idol before a Virudhachalam judicial magistrate's court and keep it at Nageswararswamy Temple, an icon centre, in Kumbakonam. There are pristine Temple all over India in many villages – most temples attract huge crowds and devotees are contributing lakhs of Rupees to Temples…….. but the money does not go to God or to the Temple or for any activity connected with religious purpose !! The idols were sculpted intricately not for being admired for their beauty but were ‘the ones meant for worship’ in the big temples decorated by them…………… sadly some are not in their designated places. Some are lying as showpieces in Art galleries; some whether recovered or even taken away from the temples are kept in some other Temples in a nearby bigger city. The Govt Dept would conveniently say that it is not safe to keep the idols – the HRCE & Govt which takes away the revenue does not feel the need to protect. The primary purpose of divinity of the idol is not kept when it is kept in display elsewhere without the routine rituals. Sadly, it does not augur well for the Temple or the agama sastras. It pains.